Savvy marketing means far more than “good luck.” And while the noise floor often resembles a tsunami of static, some brands and banks do succeed mightily. But they're certainly not doing it by the playbook of a generation ago. 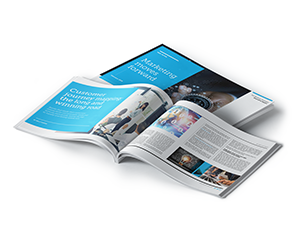 In this executive report, we examine a number of lessons financial services leaders can leverage to develop innovative and strategic marketing tools to engage effectively along the customer lifecycle. Banks that study their customers’ interactions can anticipate needs and remove pain points, paving the way to loyalty and lasting satisfaction. Here’s what leading retailers can teach us about creating consumer engagement to robust loan traffic. In 2019, banks face a critical challenge: turning their data storehouses into their greatest asset in reaching, keeping and serving customers. Here’s how smart omnichannel marketing can maximize your return on investment throughout the customer journey.